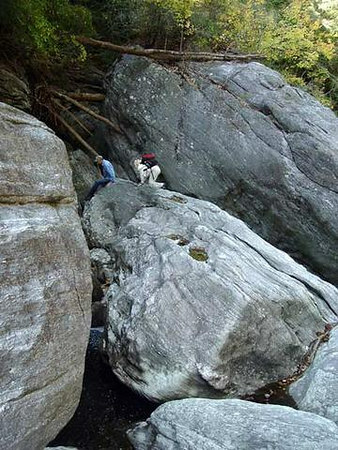 Kenny and Dana Koogler crawling over mammoth sized boulders in Bonas Defeat Gorge. Bonas is the gorge below the Tanassee Dam and the flood gates are controlled remotely from 100+ miles away in Charlotte, NC. People aren't supposed to be in here. If they pull the gates .. you're a goner. There isn't much way to get out. We are at the crux of the gorge.. the most difficult part of the trip down river. One wrong move here can get you killed, injured, or just hopelessly stuck. We made it out just fine!